The mounts are the basis of a complete roof carrier system. Special fixtures must then be added to transport luggage, bicycles, skis, surfboards or boats safely on the roof. Suitable accessories are available from your Volkswagen dealership. You must observe the fitting instructions that were delivered with the roof carrier. The attaching holes at the front are on the underside of the roof side members. They are sealed with plastic screws (left close-up). The holes are only visible when the door is open. The markings for attaching at the rear are at the top on the rear side windows (right close-up). 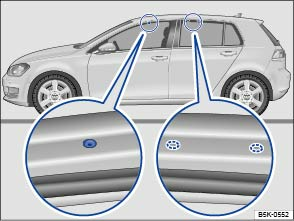 The roof carrier must only be attached at the holes and markings shown in the illustration. The attaching holes at the front are located on the underside of the roof side members. They are sealed with plastic screws that must be removed before installation (left close-up). The markings for attaching at the rear are on the underside of the roof side members (right close-up). The holes and markings are only visible when the door is open. The roof carrier must only be attached at the markings shown in the illustration. Incorrectly attaching the mounts and roof carrier, and using them inappropriately, can cause the whole system to fall off the roof. This can cause accidents and injuries. Always observe the manufacturer's instructions. Only use mounts and roof carriers when they are undamaged and fitted correctly. 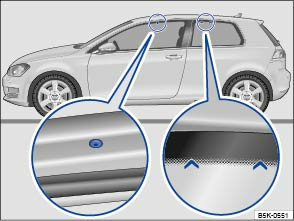 The roof carrier must only be attached at the holes and markings shown in the illustration or . Fit mounts and roof carriers correctly. Check the bolts and anchorage points before starting your journey and adjust as necessary after driving a short distance. During a long trip, check all bolts and fasteners at each stop. Special fixtures for items such as bicycles, skis, surfboards, etc. should always be properly installed. Do not carry out any alterations or repairs to the mounts and roof carrier. Read and observe the instructions provided for the fitted roof carrier system and carry them in the vehicle at all times.